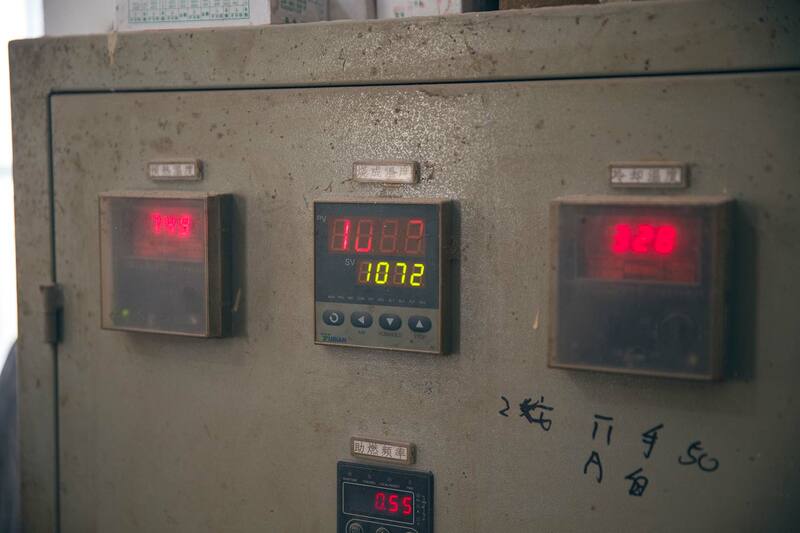 We were quite fortunate during our visit to have several contacts ahead of time in Yixing, all who serve different markets – low, mid and high end. It’s often best to see something from all sides to truly understand it, and this granted us insights that we wouldn’t have if we simply just let ourselves be dazzled by nice presentation and stories. 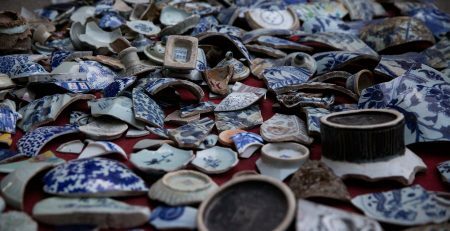 It also made some of the factors that go into pricing Yixing wares a bit clearer. 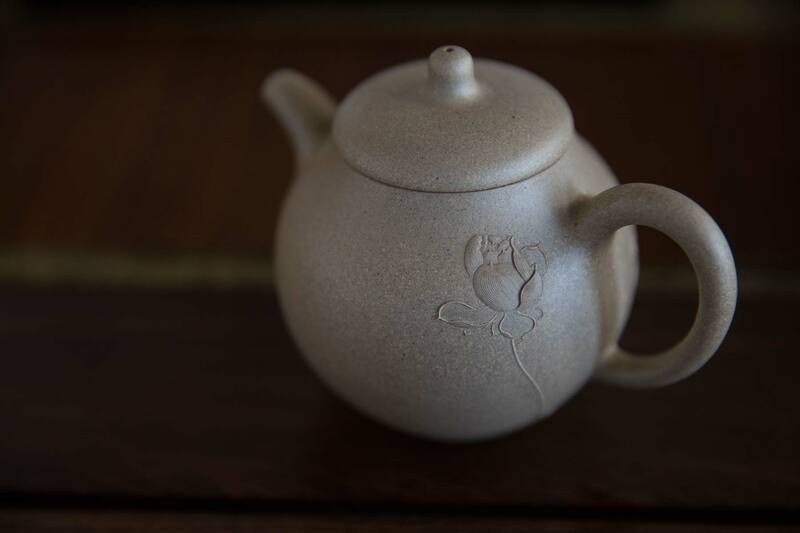 One individual we met up with primarily produces low-mid range teapots. This was not something we were interested in carrying ourselves, but it was thanks to him that we were able to see some sides of the industry that would have been near impossible on our own. 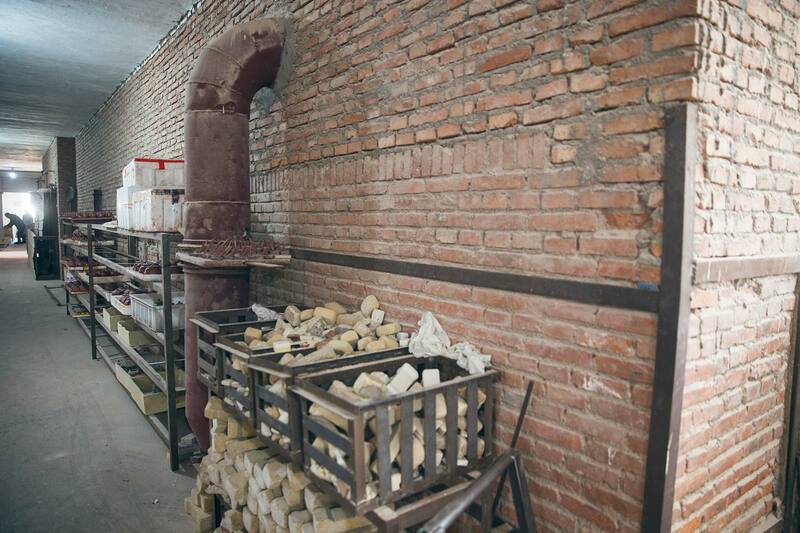 The first stop was a clay processor for large scale producers, which was particularly interesting, if not eye opening. 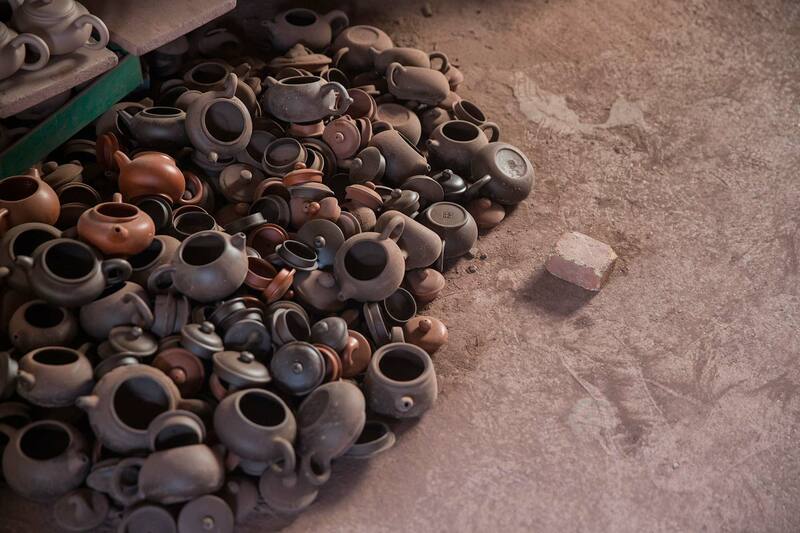 When we say large scale, we mean for operations that produce hundreds of thousands of pots at a time. 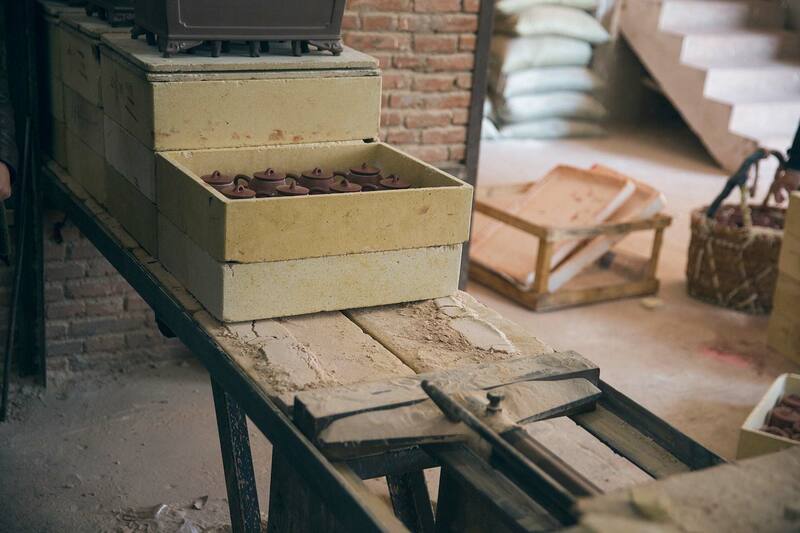 Stacks of clay were piled all over the facility, along with questionable bags of powders that were stained in various shades of red. As we went further in, several people were mixing and filtering clay. One notable sight was a large mixing barrel that had a film of red-oil, not unlike chili oil, on the top. We weren’t kept there for too long, but suspected that this phenomenon was not necessarily a natural part of the clay extraction process. 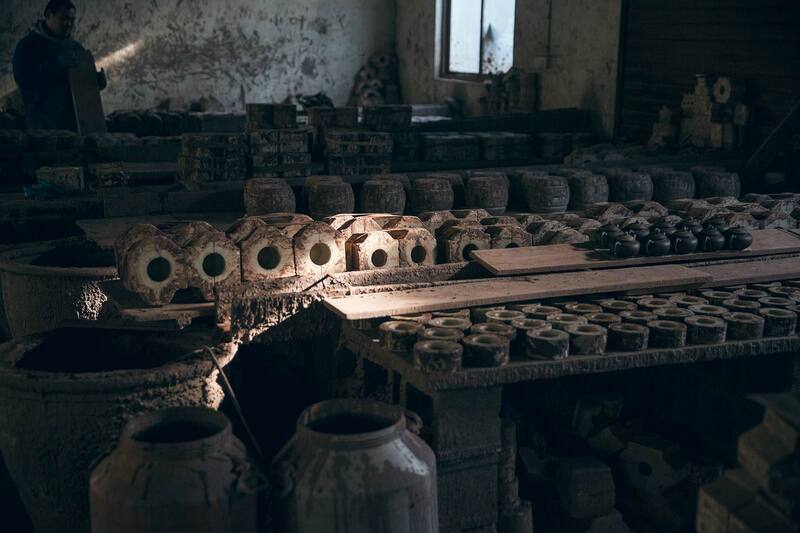 Moving on, we witnessed the production of half-handmade pots. 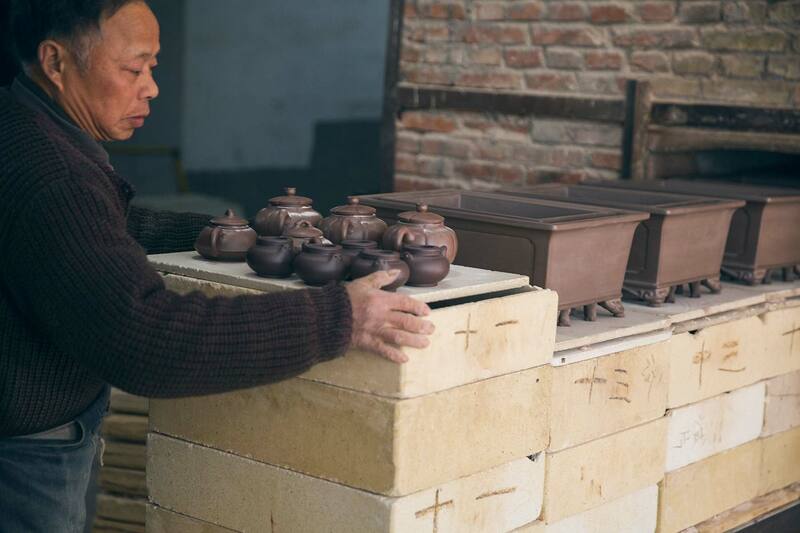 For those wondering, this means that the pots are made quite similarly to fully handmade pots, except that the basic shape is formed by taking slabs of zisha clay and pressing them into shape using a mold (not the same mold as used for slipcast teapots though). 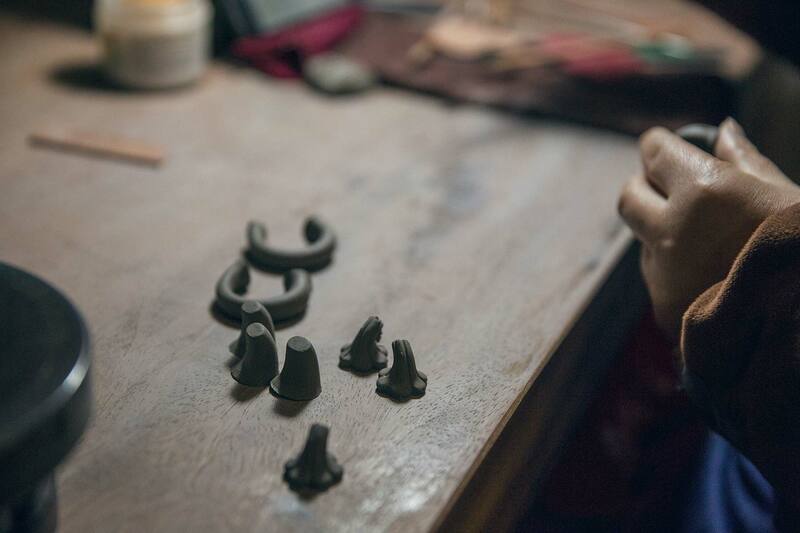 This still uses the same type of clay as fully handmade pots (which are typically slab built, not wheeled), but speeds up the process of forming the basic shape of the body, spout and handle. Although this is quicker, a fair amount of detail and finishing is required by hand. 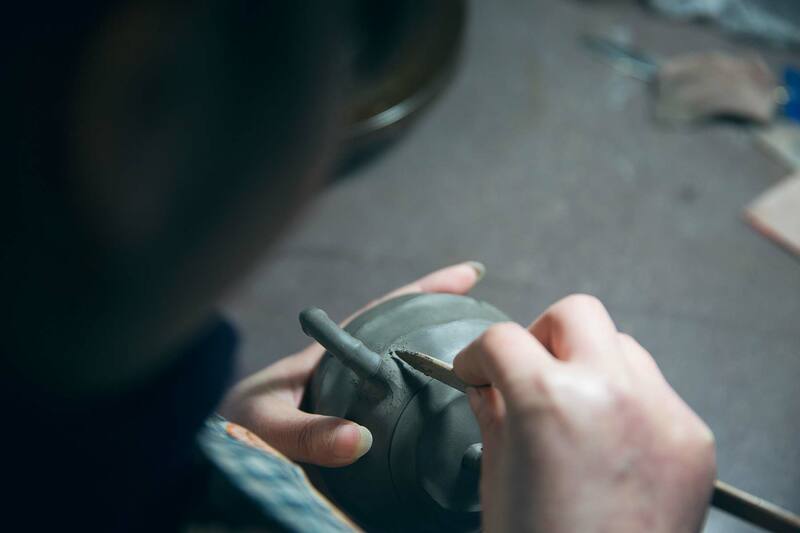 For teapots with significant artwork, an artist still has to spend quite a bit of time working on the detail. 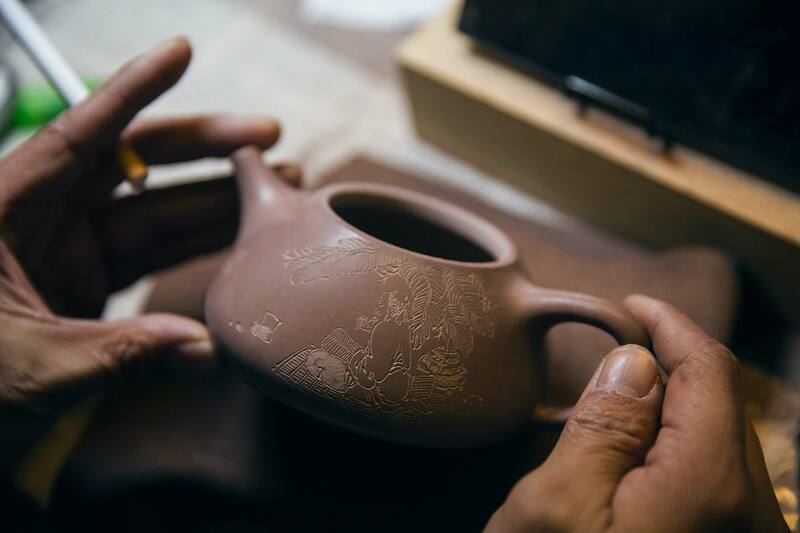 At some point the artist’s (or “master’s”) stamp is pressed into the bottom of the teapot (not to mention their picture on the certificate), even though 8 different people worked on this pot. After watching much of the process, we could see for ourselves that “half-handmade” does not necessarily denote a low-quality teapot at all. 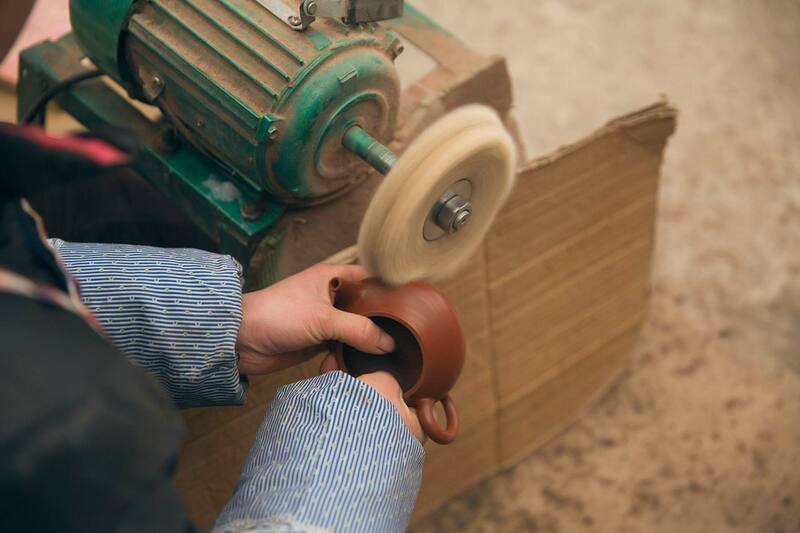 Adding the chop (stamp) to the bottom of a half-handmade teapot. 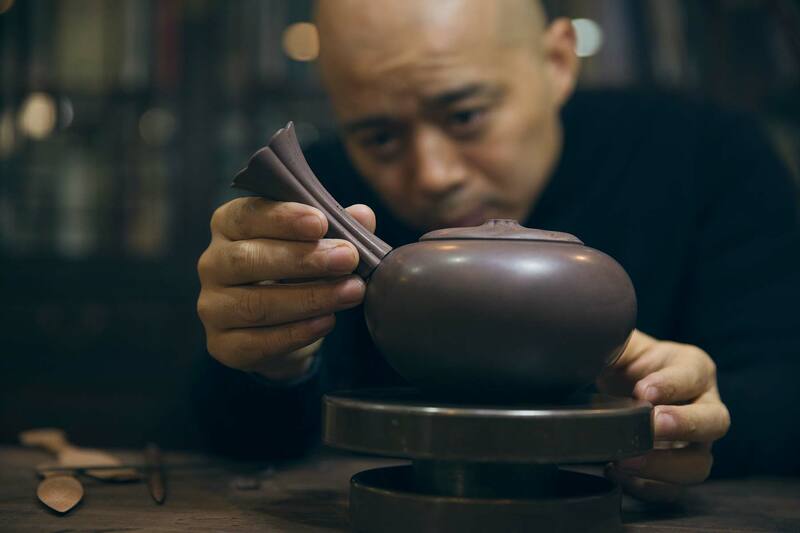 A potter copies a design from a picture. It’s not clear whether the worked is copying a picture of this studio’s design or a design created by someone else, but it’s most likely the latter. 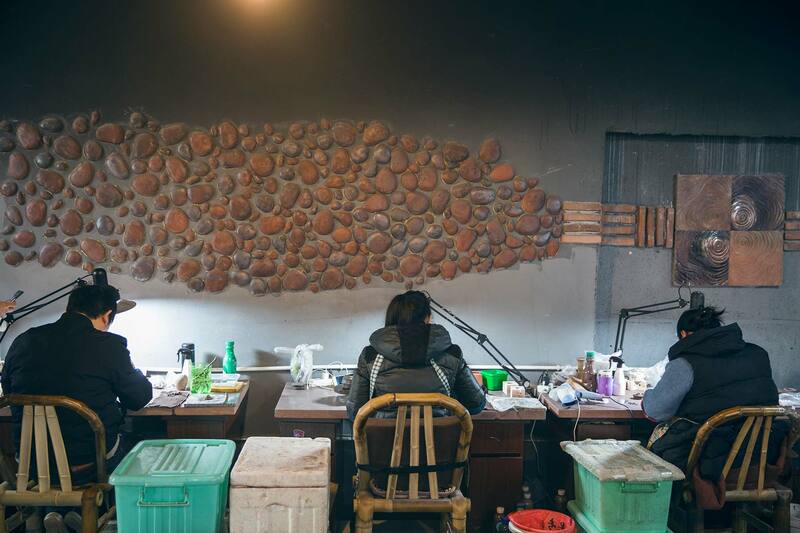 This is why many artists and people creating unique work in China prefer to keep things to themselves for as long as possible. People are more likely to copy a piece detail for detail than come up with their own design, and in some cases those with more money behind them can do so at a larger scale and drown out the original creator before they can even get to market. Finally came the slipcast production. 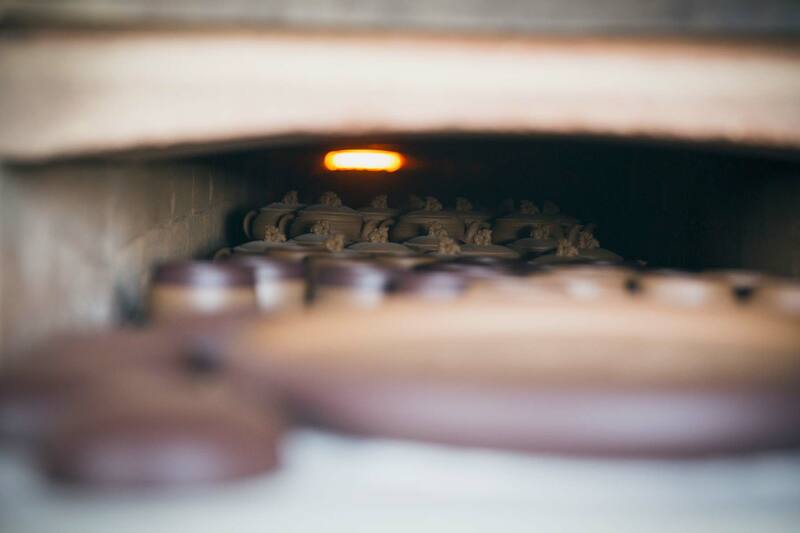 Long lines of molds sat either empty or full of slurry (liquefied clay) that was holding the shape, absorbing enough water until they could be opened to reveal an intact and formed teapot shape. The number of “zisha” (or close enough) teapots on racks was overwhelming. But even for this operation, enough manual work was required to end up with a finished product. 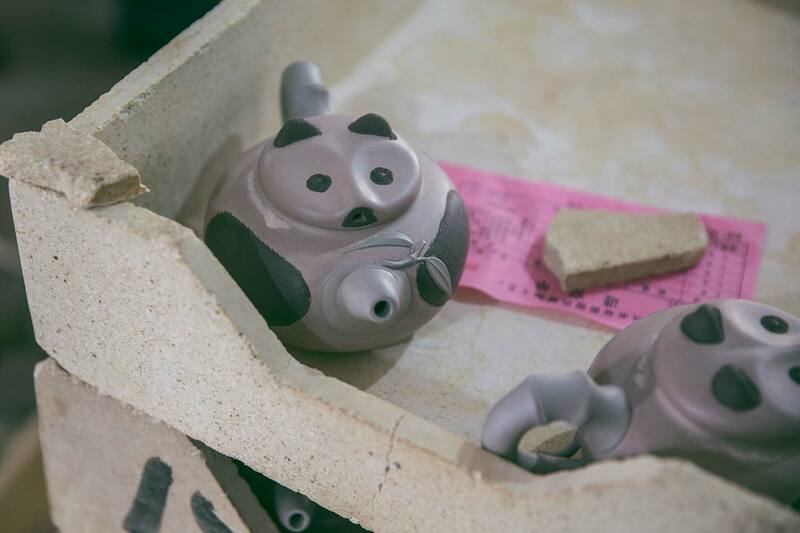 Molded bodies still need a human to attach and finish that molded spout. Ball filters, lids and handles also needed to be finished and attached. Lines from the slipcast needed to be smoothed by hand and a stamp needed to be pressed. 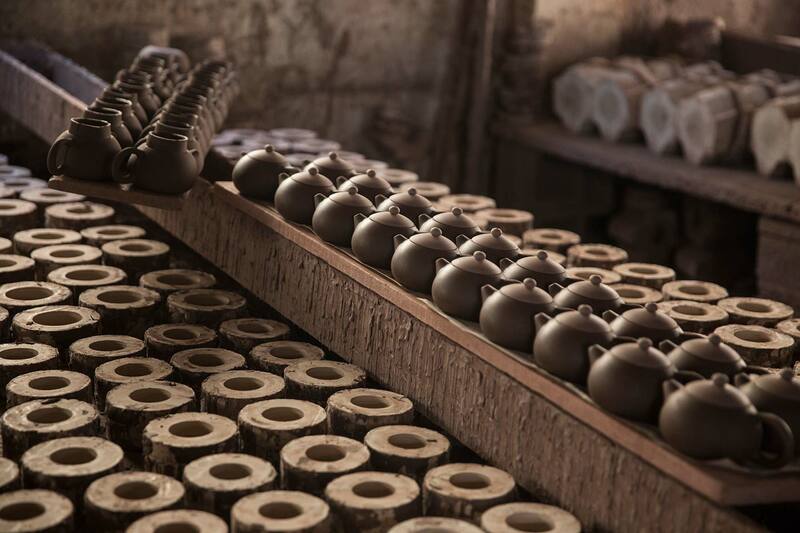 While real zisha can technically be used for slipcasting, with some pots costing only $5 or less, it would be hard to imagine any clay of considerable quality being used. Meanwhile the finished result for some of these slipcast teapots isn’t necessarily all that bad. 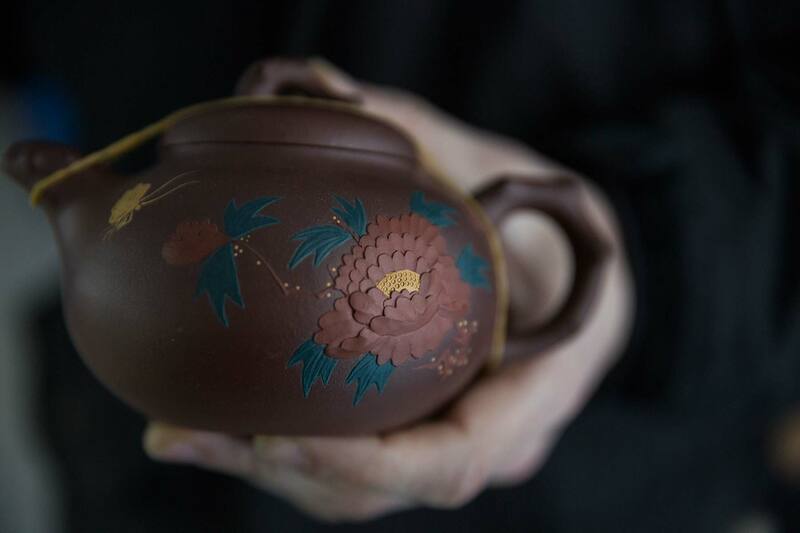 If you were to follow the most common cues of a “quality” teapot that people recommend, many of them were there – tight fitting lid, no visible seams (smoothed over), the spout perfectly level with the body, multi-hole ball filter, and even a decent ring when clinking the lid. Lid-nub finishing. 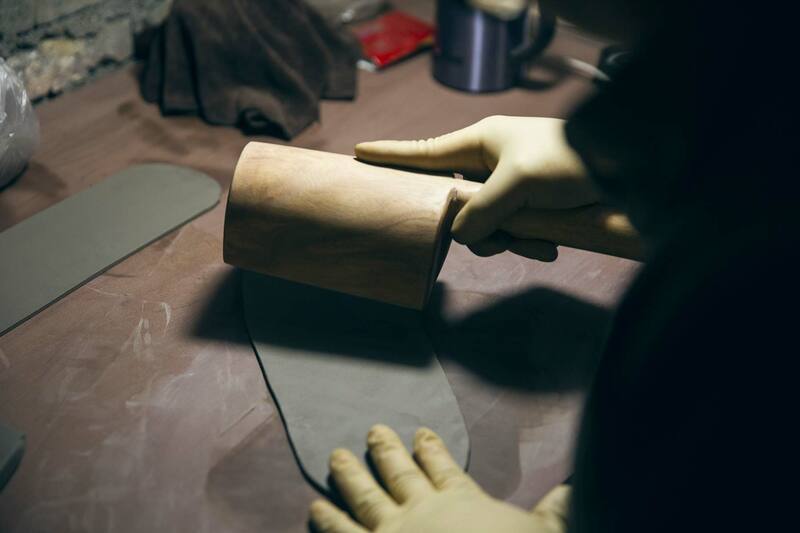 Even slipcast pieces still need a human to make them pretty. A basket of really cheap teapots. A part of why these slipcast teapots all had nicer fit and finish than expected was clarified when we next visited a slipcast mold maker. 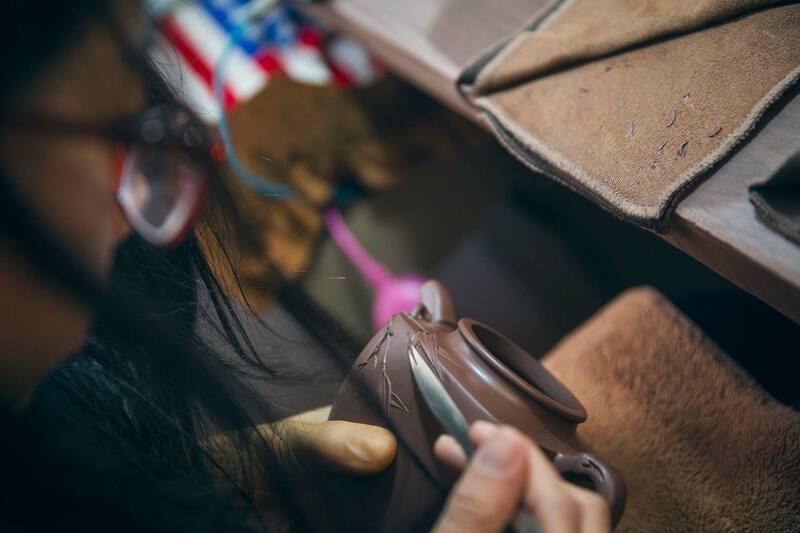 Naturally, to make good slipcast teapots requires good slipcast molds, which require extra effort and attention to detail. 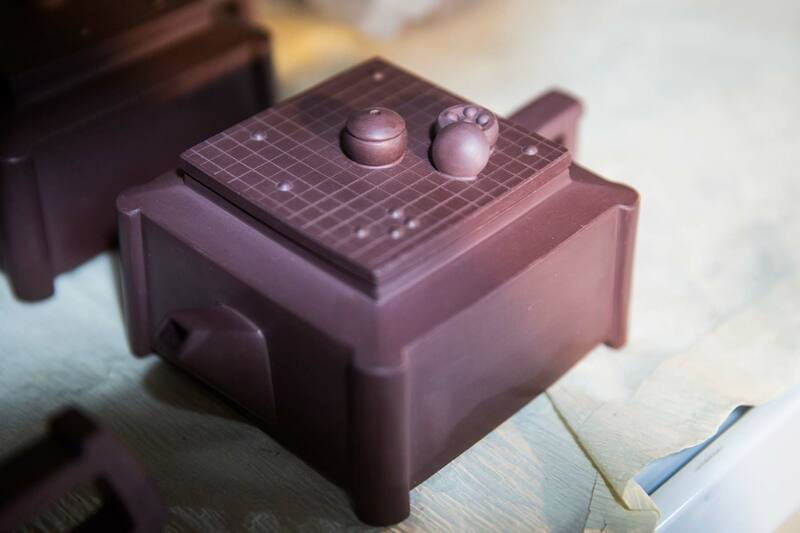 We were told that the quality of molds can vary from one to another, but if something is going to be used repeatedly and consistently, the extra investment in quality is worth it. As a small semi-related segue, many of the sellers and makers we met seemed interested once a foreigner showed up. This is not an unusual thing and happens in Yunnan as well. They often wanted to have me hold a teapot and take a picture with me, or something to that effect. While this is not my favourite activity, I occasionally oblige if the situation requires it. After this the seller would likely claim that this “Canadian/American/Australian/whatever nationality I made up on the spot” came to Yixing to buy and export their teapots and trusts their quality, even though we didn’t buy a single thing. This is not particularly important on its own, but demonstrates the amount of show and embellishment people are willing to put into their marketing. 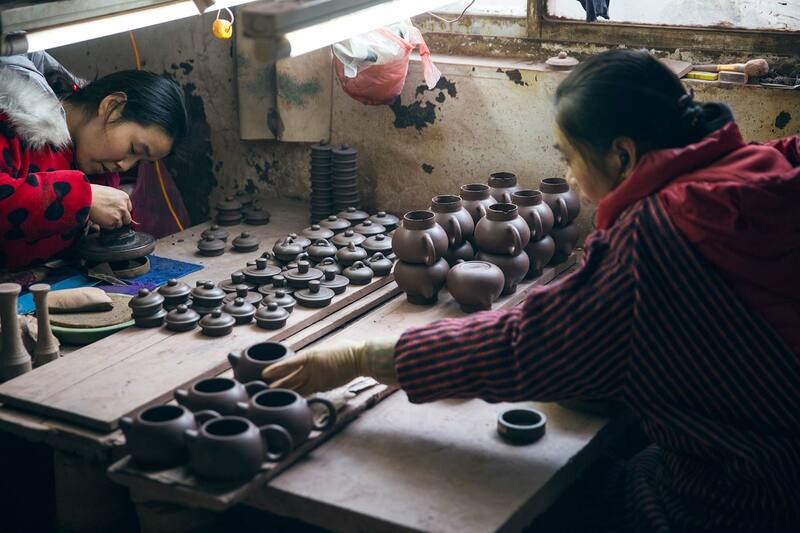 When someone invites you into their workspace, shares their knowledge and allows you to take pictures of their process, the least you can do is let them take a few pictures while holding their teapots. Many shops and makers have catalogues of their work that include pictures of them holding their work with important figure xyz, the vice president of some company, or a “foreign businessman” (just don’t ever call me that). In at least one that we picked up, it was clear that at least 80% of the photos were photoshopped. Most people might not realize this at a glance, but to someone who uses the software on a daily basis, it was obvious. The actual work in the shop was quite nice and priced accordingly. 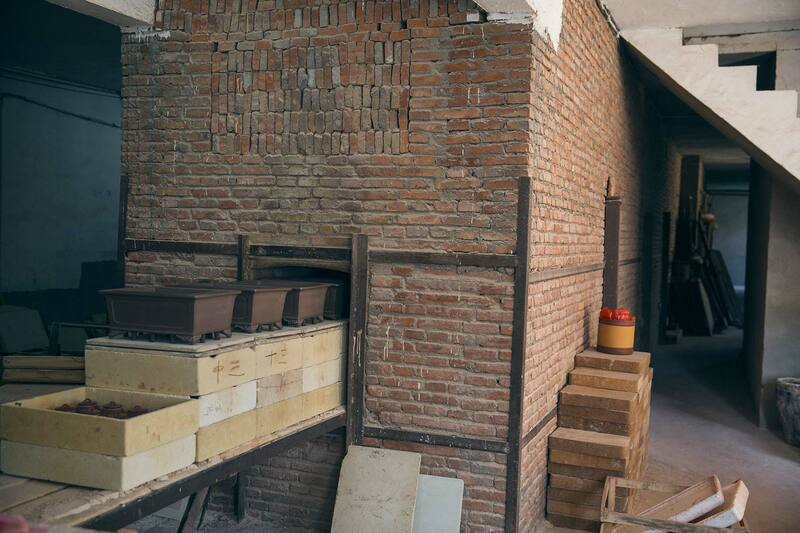 Her family has been in the industry for generations, and their workshop was in the back, behind their shop, with the father/”master” carefully working away. 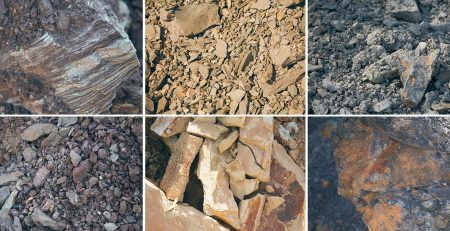 They didn’t seem to need to fake the pictures to gain credibility, but they did it anyway and without thinking, just like everyone says their clay is Huanglongshan/Zhuni/old clay/etc. Again, this felt very analogous to the tea industry how so many people feel the need to keep up with the Joneses, if even just in appearance. 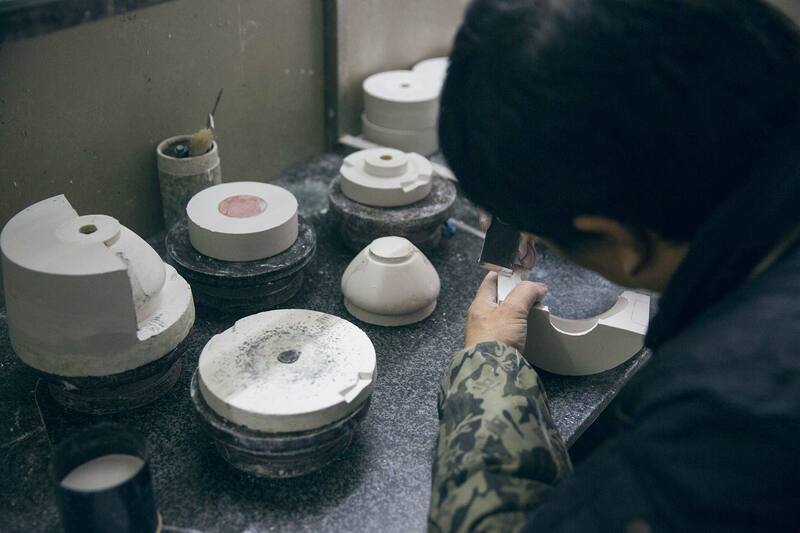 While our interest is mainly in finding good quality and reliable studios for half and fully handmade teapots, seeing the operation of a slipcast production was eye opening and beneficial, even if we have no intention of ever carrying slipcast ourselves. 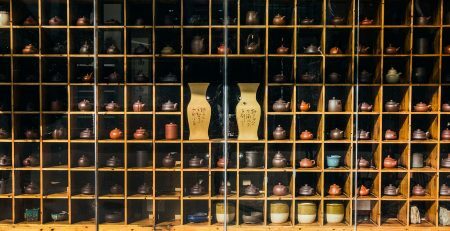 On the other end of the spectrum, and equally unlikely for us to obtain, was the high end (and we mean high end) artists and masters – the kind of teapots that end up displayed in small museums before being purchased. 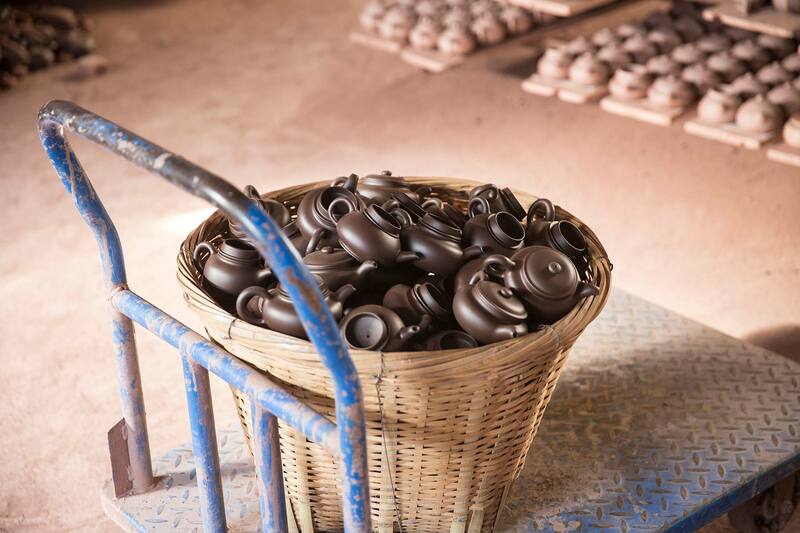 These are the teapots that are least likely to face heavy scrutiny when it comes to the quality of the clay. 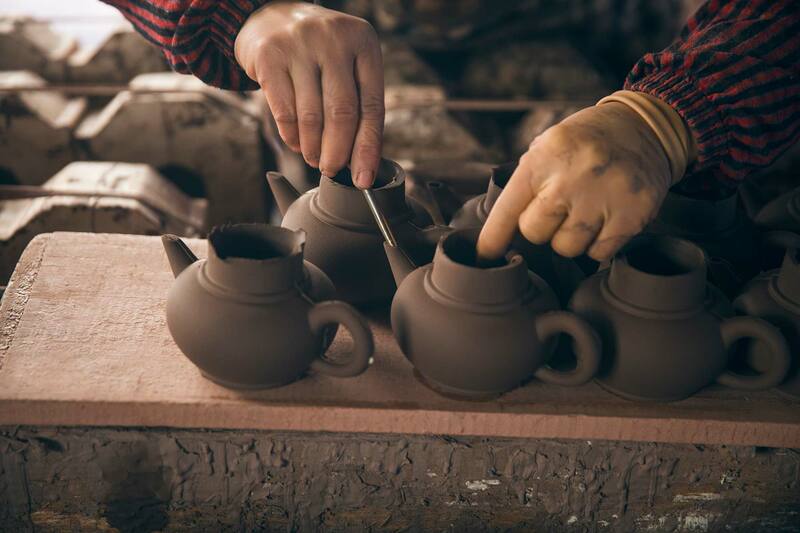 Their work commands hundreds of thousands RMB for a single teapot, so the clay quality has to be unquestionable, which is why they source from the reputable sellers of Huanglongshan clay, as shown in the previous post. 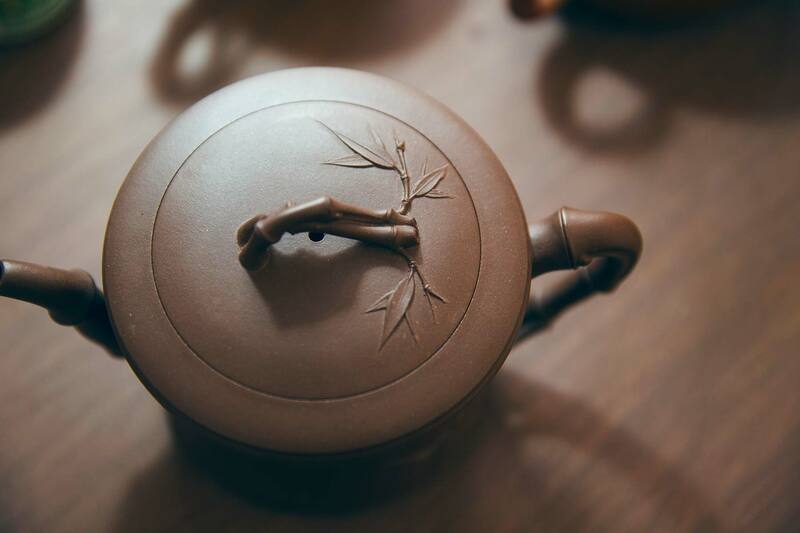 A delicately scultped duanni teapot that sells for roughly the cost of 25+ Yixing teapots from yours truly. 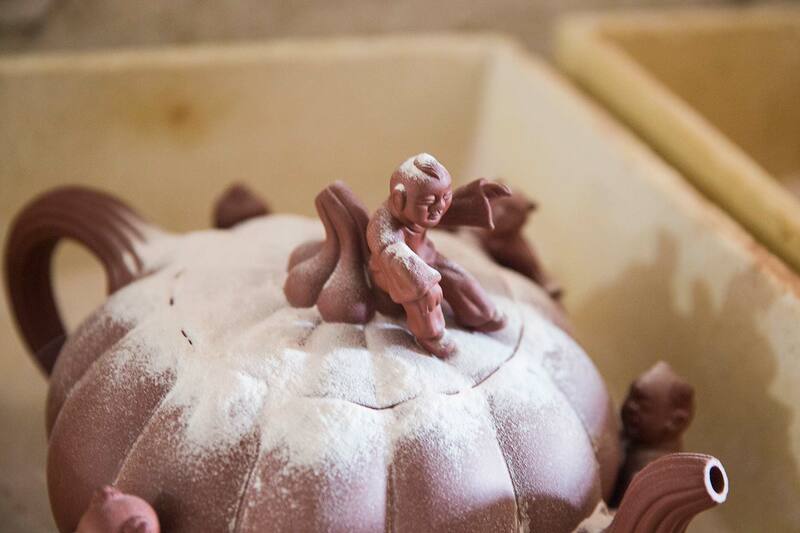 With clay quality more or less checked off, the next factor is the quality and experience of the artist or “master”. For the slipcast and half-handmade pots that we previous mentioned, there were more qualitative standards to look for, like fit and finish. 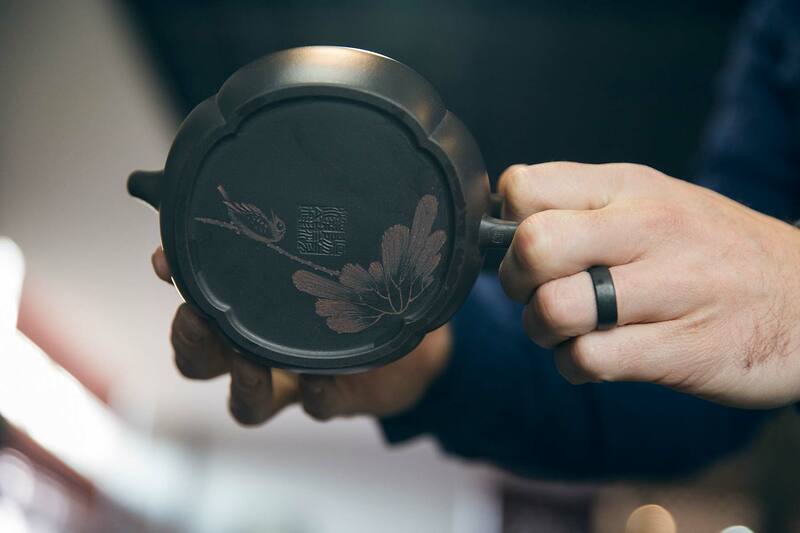 When you get into the stratospherically priced pots, you’re no longer buying teaware, but rather a piece art. Beauty and value are all very subjective. Reputation and distinction also come into play. 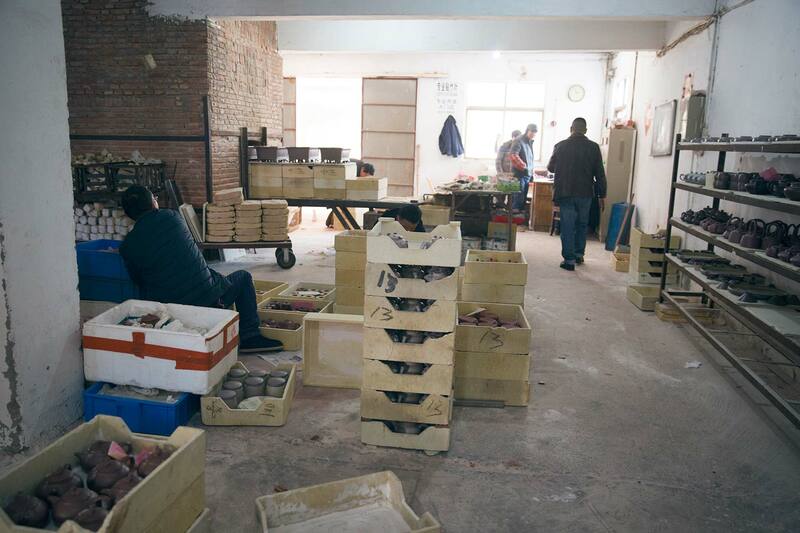 Compared to the shop we previously entered with beautiful handmade pots at reasonable prices for their quality (~$300-1000USD), the last artist we visited did not need an accessible storefront, and instead hosted guests (usually wealthy elite from Shanghai or Beijing) in an open concept high rise studio. There’s no need to photoshop yourself with “important customers” when your name is already enough. 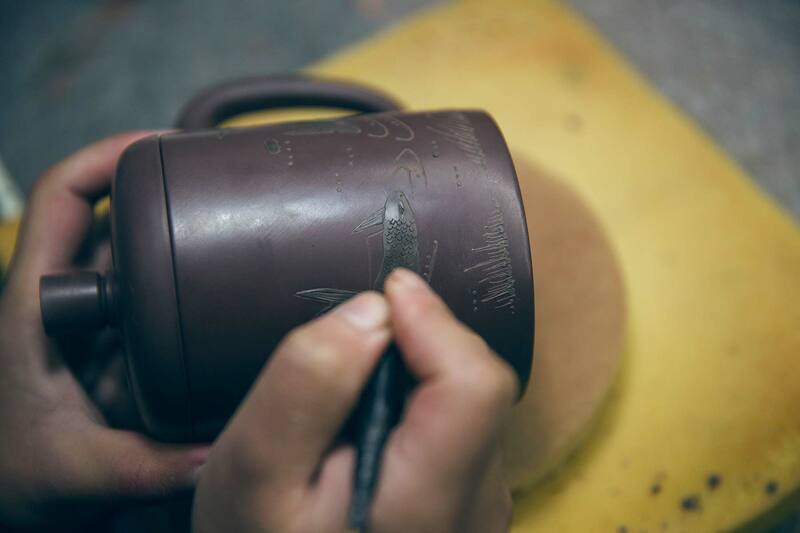 On his work table sat a pot with intricate carvings and delicately sculpted text on the surface. He explained that this pot was ordered by a customer several months in advance. While we sat down to chat, each change of tea was accompanied by a change of teapot, each one worth roughly the price of an Audi. 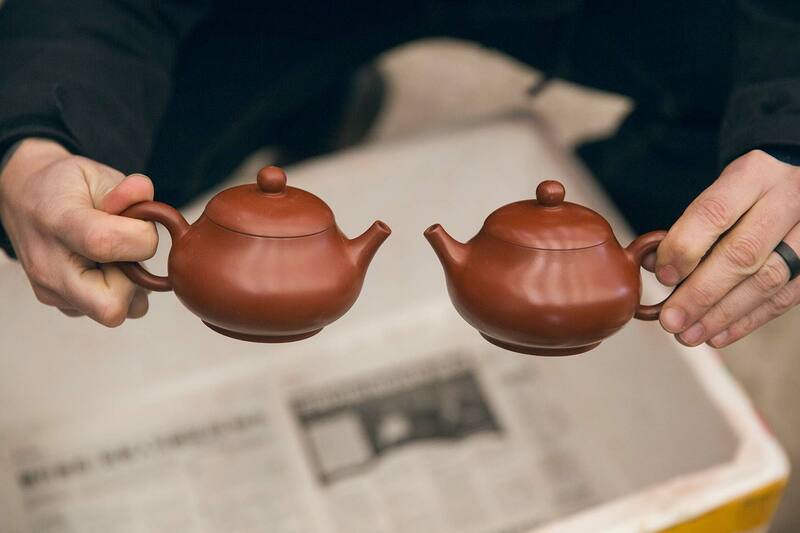 Without the ability to compare side by side, it’s impossible to say if the tea tasted that much better in these pots (I suspect not necessarily), but the beauty of each one was unmistakable. Worth it though? Perhaps, if you can afford it. 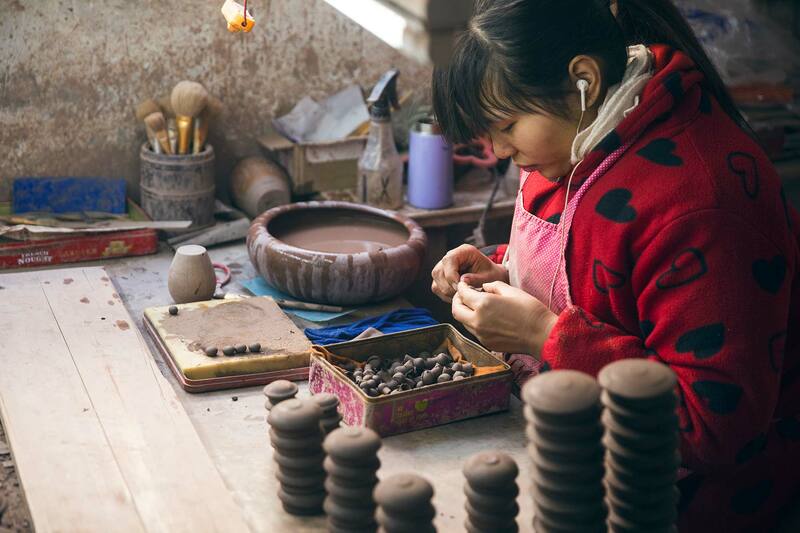 This artist is likely the envy of many artisans and potters. 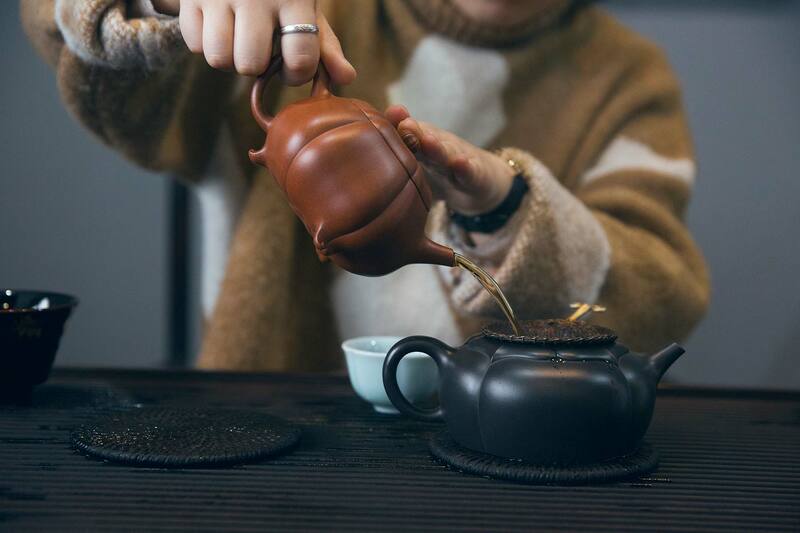 Someone who doesn’t have to produce work to attract customers, but who has customers seek him out and offer several times an ordinary person’s monthly salary for him to make them a teapot. 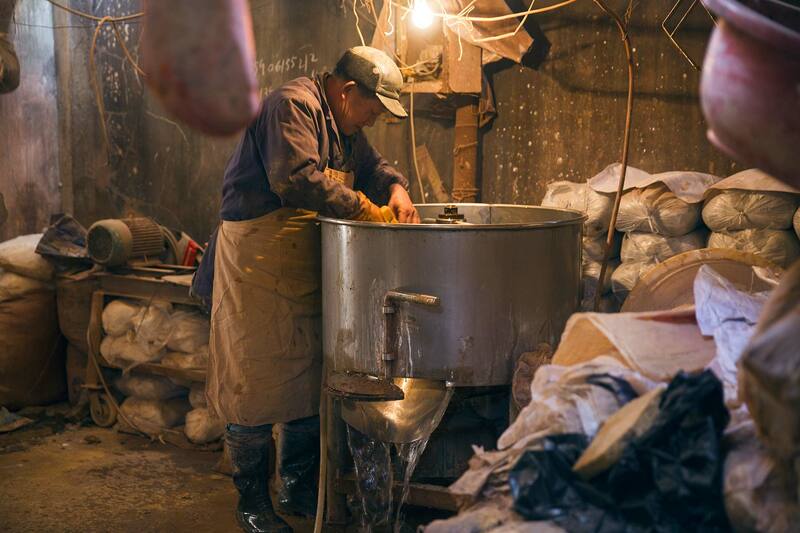 And for the obligatory puer scene-comparison, similarly one village – a Bingdao, a Laobanzhang or a Xigui – eventually blows up and farmers can sell their tea for an unthinkable 10k+ RMB per Kg. Farmers in villages near and far are sure as hell wishing that was where they lived. And so begins the push for their tea to be the next big thing and for their turn to become rich. The swarms of potters in and near Yixing must feel the same way when there are a handful of masters whose name means something. So what can you do? Well, talking yourself up is a good start. Write about how your family (doesn’t matter how distant) worked in Factory 1 back in the day. Yes, my father or uncle was, uh, Master Zhang/Zhou/Li/Wang from factory one. Nobody’s going to look into that though, are they? Show off all your credentials, accolades and prizes – or make them up if you have to. Write blog posts about yourself on Weibo or hire people to do it for you. 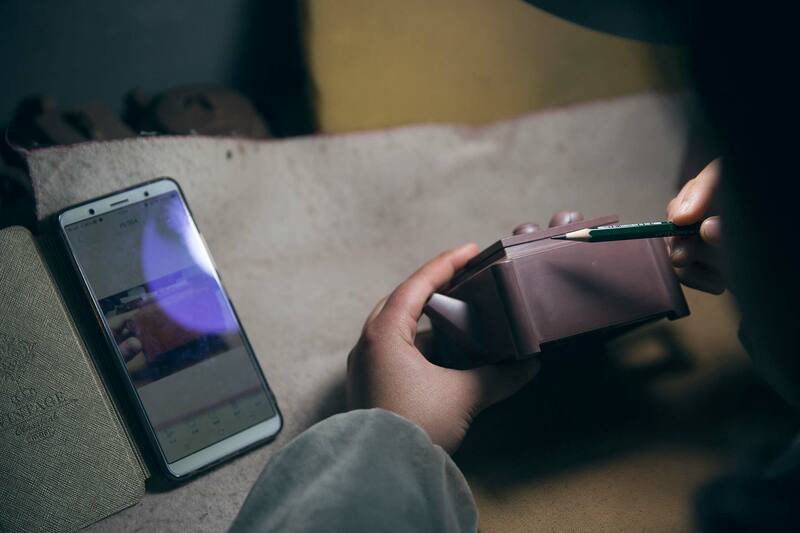 Then there’s our personal favourite: Create listings for your teapots on Taobao with a price of 10 000+ RMB, then show customers. They will be thrilled when you offer them the same style of pot in person for much less. 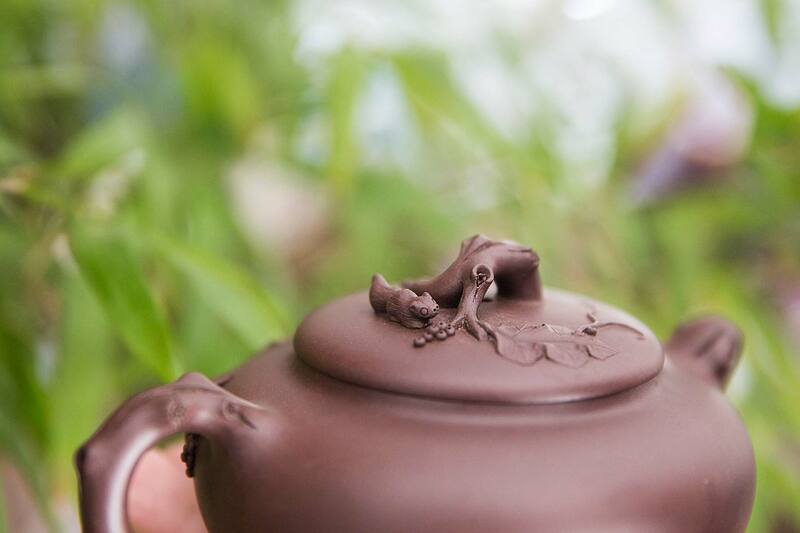 The engraved bottom of a “smoked” teapot. 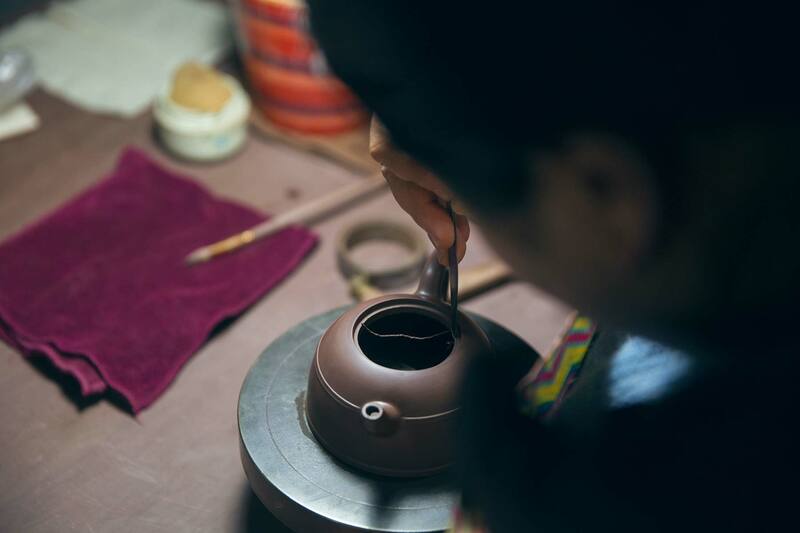 While Heini (black Yixing clay) does exist, it’s not suitable for teapots as it breaks too easily. In this teapot’s case, it was smoked to create a black colour, then intricately carved afterwards. This all brings us back around to the same question – how do I filter out the good, the bad, the worthwhile and the “fakes”? 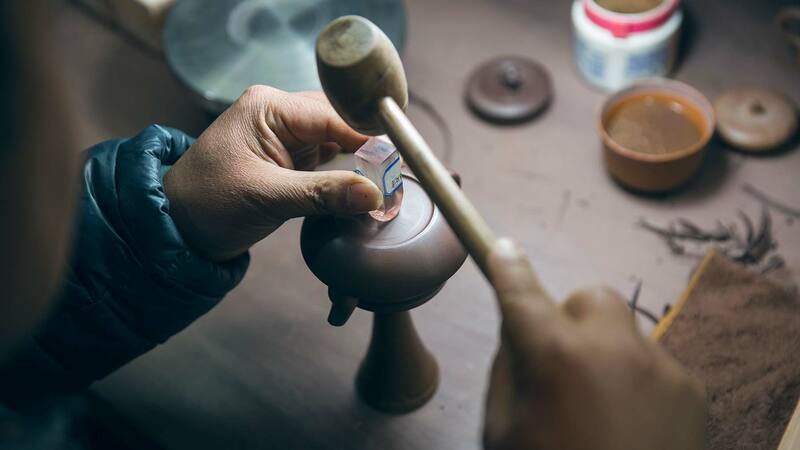 The most important things when searching out a source for Yixing zisha teapots is not shape, size or what clay was claimed to be used, but rather trust and an ability to read between the lines. Check the boxes as you go and decide what’s important to you. A good start is price. Is it too good to be true? 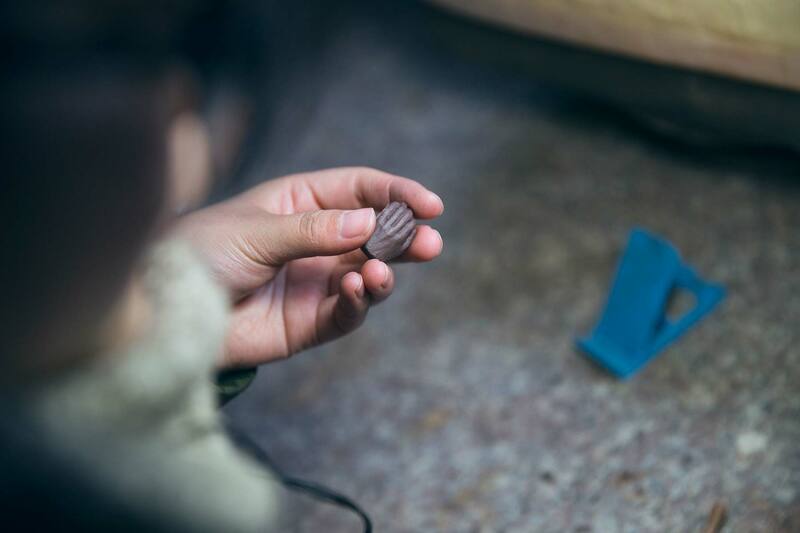 What are the chances that this has potentially harmful dyed clay? This is probably the most important question to answer, as any potential long-term health risks are not worth saving a few bucks. Save up a little more and get something you’re comfortable with. This should be the most inflexible rule. Number 2: Decide what’s important to you and evaluate. Functionality and fit and finish are good ones. Evaluate lid fit/seal, drips, pour speed, etc. 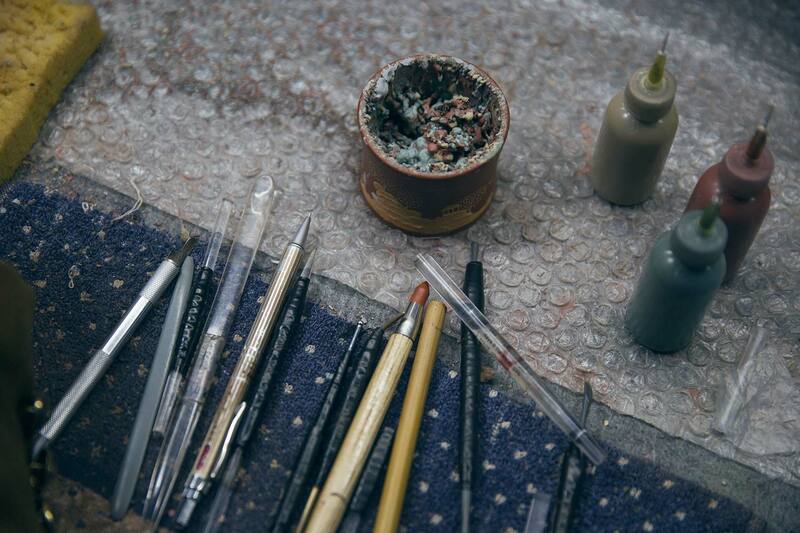 One instance where many people will sacrifice these details is with vintage factory pots. 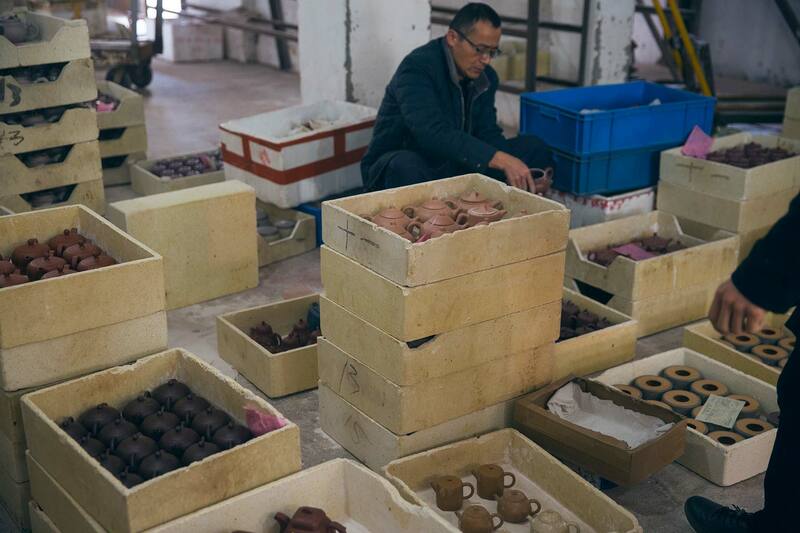 While the construction of these pots may leave something to be desired, they’re sought after as they were made before there was a scarcity of original mine clay, thus the clay quality is guaranteed. This is a very reasonable thing to do if that’s important to you. Next, work within your budget. Assuming that you trust the clay won’t poison you and that the pot performs how you like, the rest is just a matter of how high you want to go. 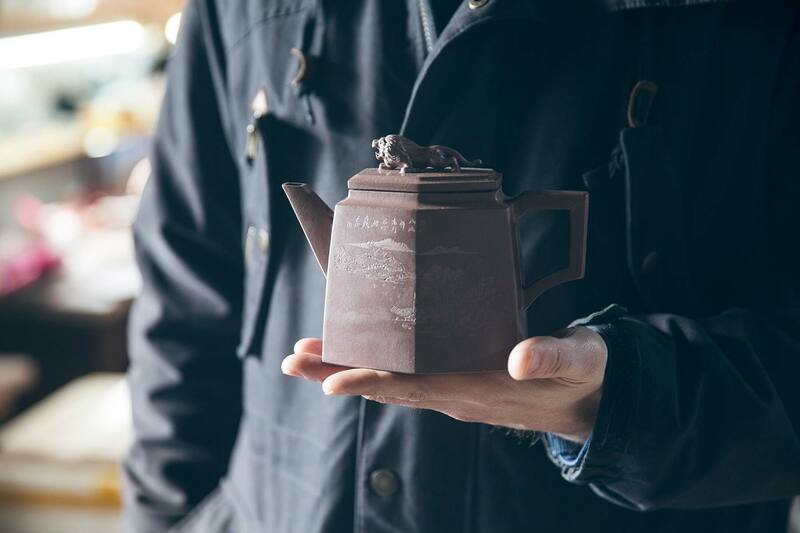 If you have the means and desire for something a bit beyond a simple vessel for brewing, something with artistic value, then the sky’s the limit. 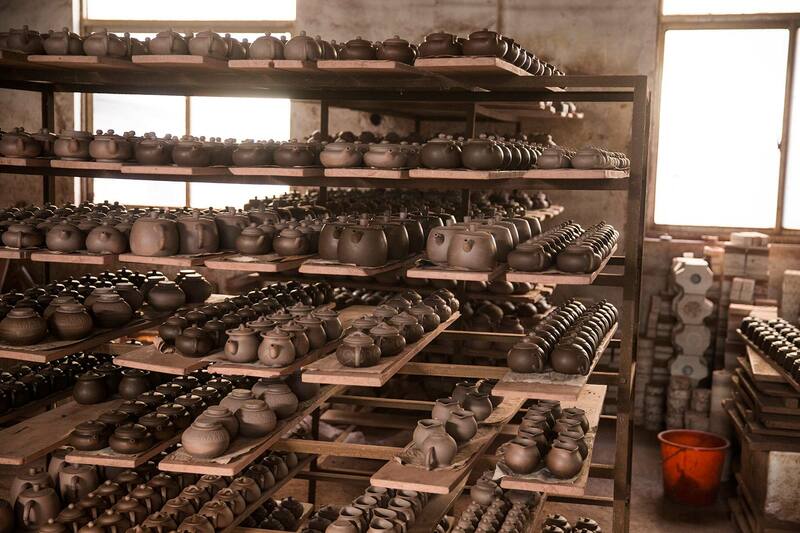 There are many beautiful pots that start from several hundred and range into the 10’s of thousands of USD. 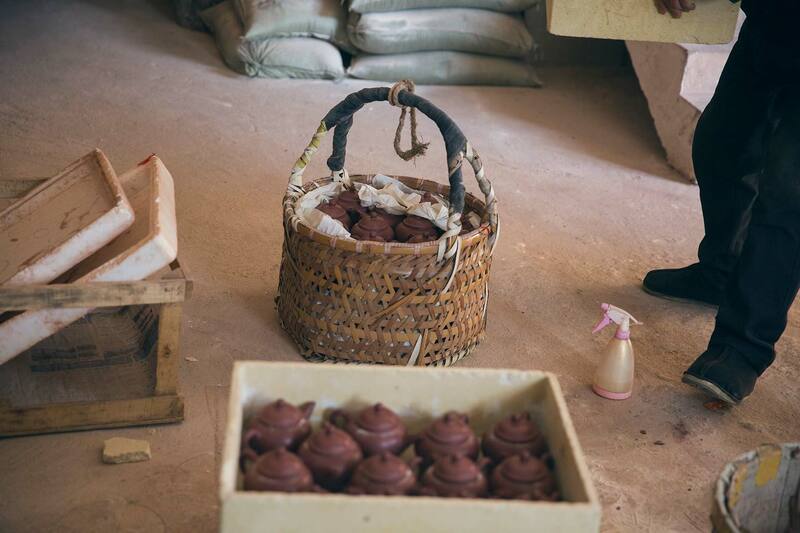 If budget is a more limiting factor, there are still attractive half-handmade pots to be had from ~$100 USD and up. Below that mark things can become a bit questionable, but as we’ve been not-so-subtly detailing this whole time, there is no way to be 100% sure. There is plenty more that could be written on this topic, and many more angles and areas to cover, but perhaps this is enough from us for now. Please bear in mind that this is largely our opinion based on first-hand experience and observations. Opinions are bound to be challenged, and potentially even changed over time. 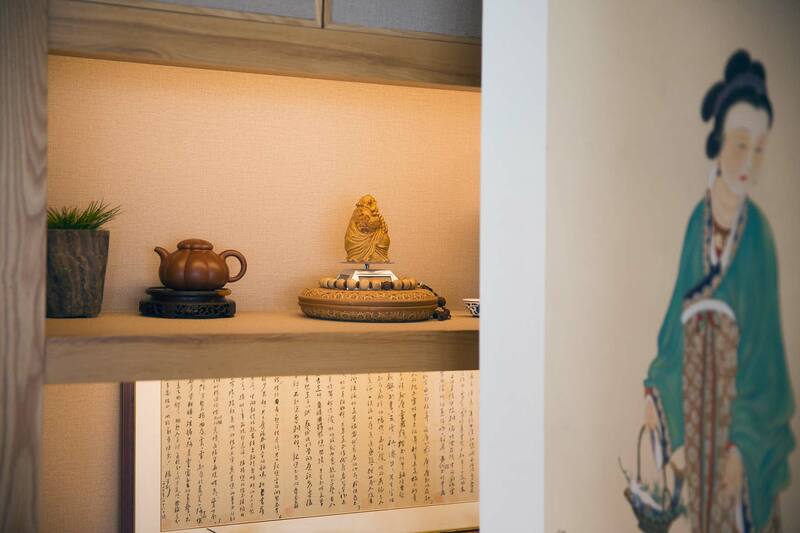 This is not gospel, but something that we hope is helpful and able to provide some insight for those who are not able to make the trip to Yixing themselves. 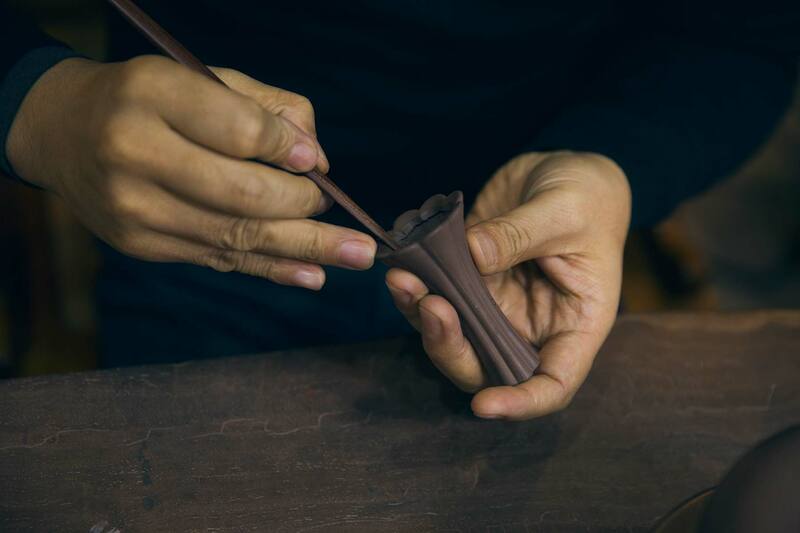 We’re always happy to chat about Yixing zisha or our own pots, so please feel free to email us if you have questions and comments, or leave them below. Bonus! Both of these pots are “brand new” and only a few days old. The difference is that the teapot on the left has been “raised” in a matter of hours. 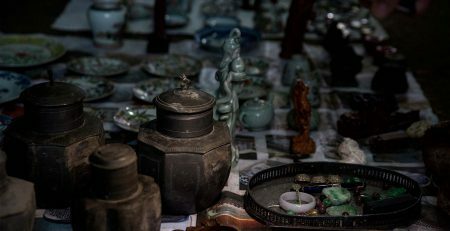 Many buyers seek out older teapots or teapots that have seen significant use, as these teapots soak up the tea’s oils and develop a shiny and desirable patina/finish on the outside. 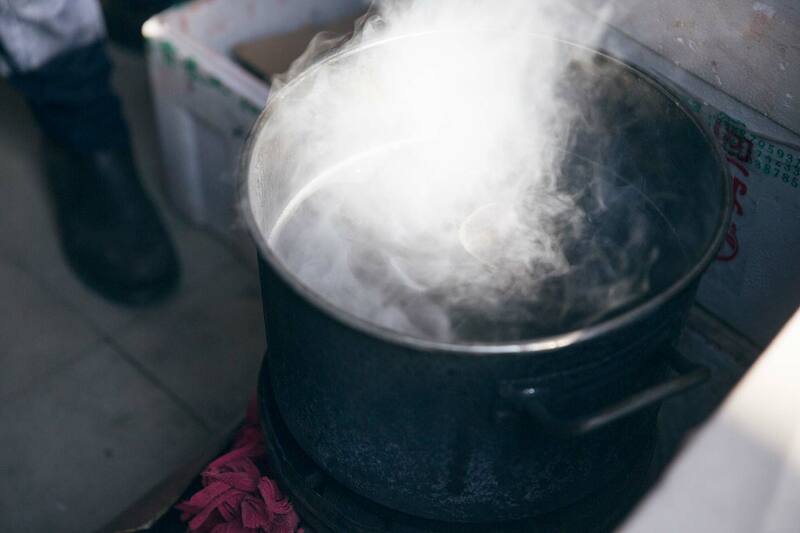 Although it isn’t very well known, there are people in Yixing who make this their business by boiling the pot in a very condensed pot of tea, then use a professional buffer to shine the teapot afterwards, giving it a healthy shine. 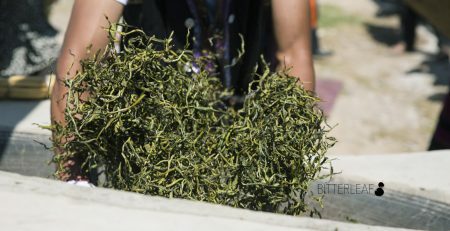 A thick batch of tea, used to season/raise a teapot quickly. 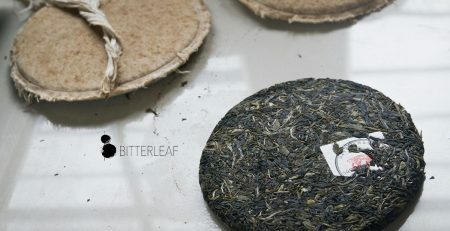 They typically use cheap, local black tea and allow the teapot to boil for several hours. 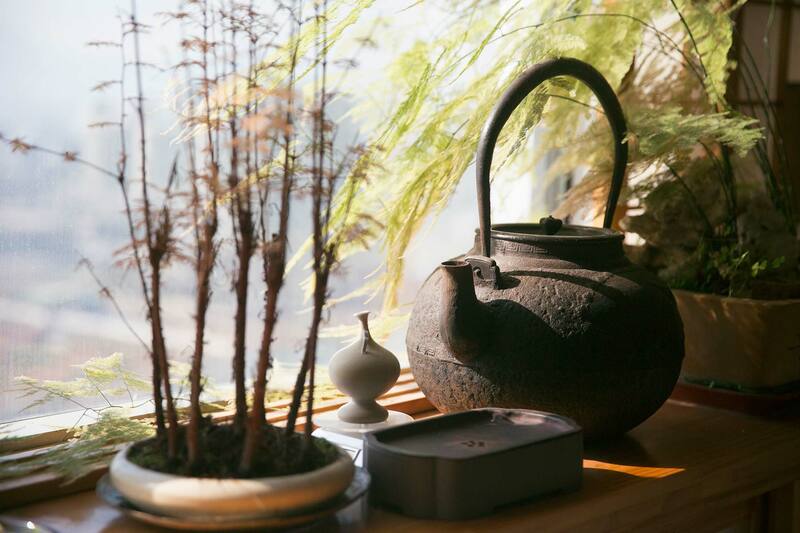 A “nihui” style teapot. 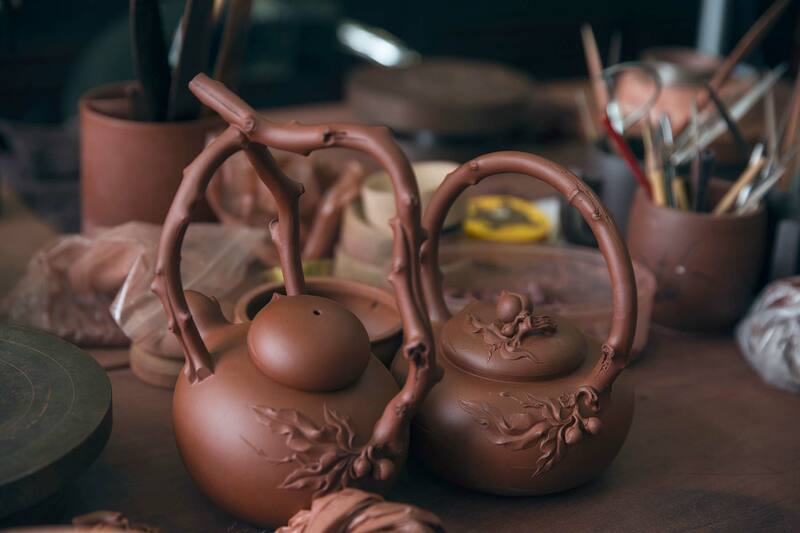 This style involves adding clay to the outside of the teapot and scultping it into shape to form an embossed image. 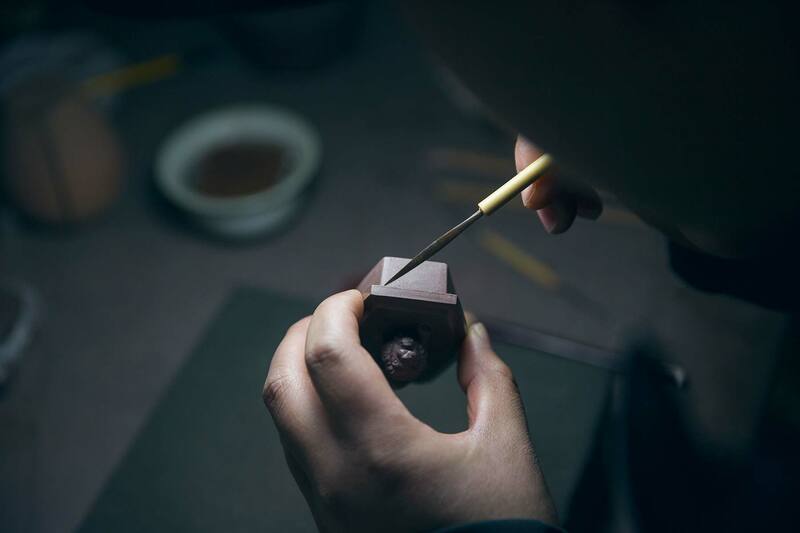 The process is quite labour and detail intensive, requiring quite a bit of work to complete each piece. 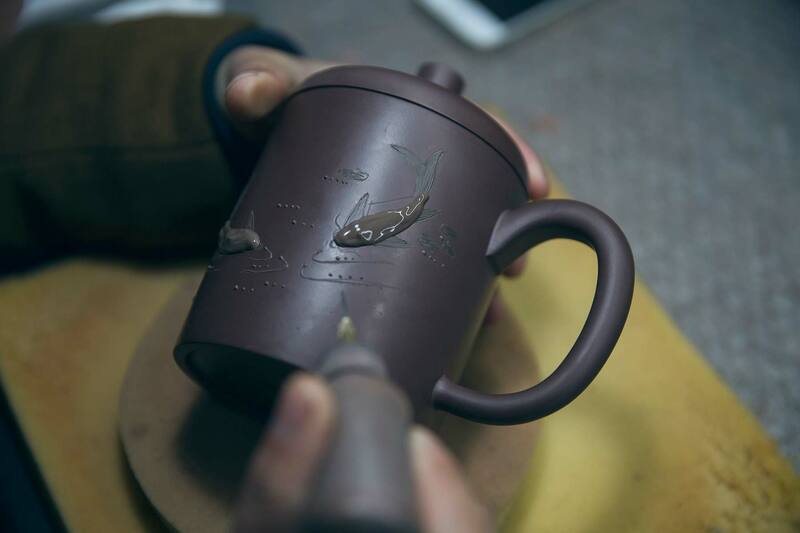 A half-handmade teapot in the hands of the engraver. When this is all you do everyday, you become quite quick. Nonetheless, it’s a valuable and respectable skill to have. More go-board teapots, at the long kiln. We couldn’t be sure whether these were from the same studio that we visited or not. 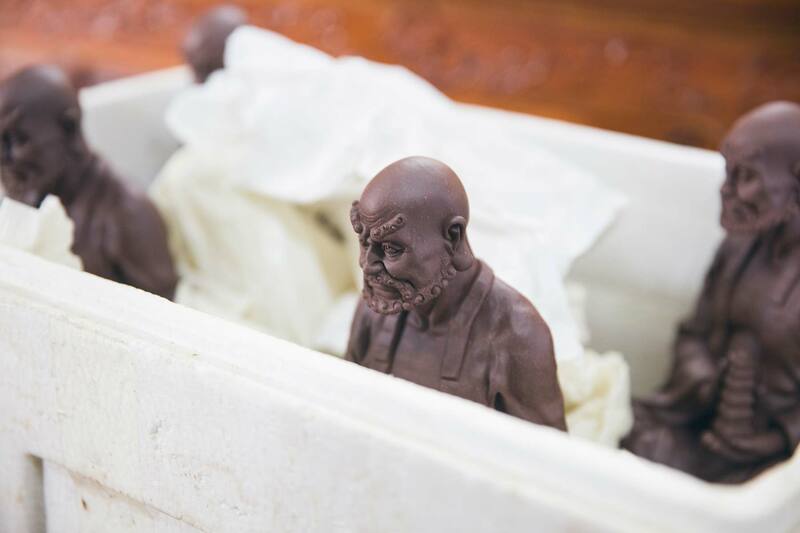 Moulded zisha Bodhidarma teapets. 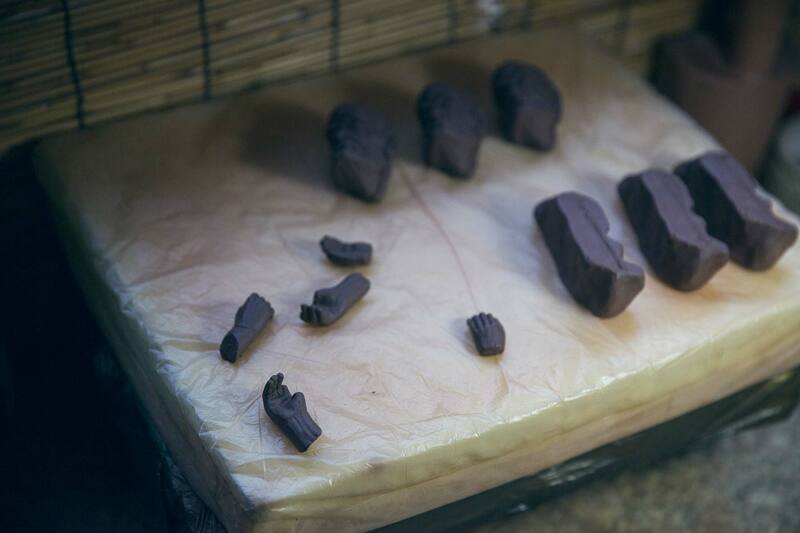 These still required a lot of hand carving and shaping.